Some models are unsuitable for use on grease or electrical fires. Choose your extinguisher carefully. A fire extinguisher should bear the seal of an independent testing laboratory. It should also be labeled as to the type of fire it is intended to extinguish. Classes of fires: There are three basic classes of fires. All fire extinguishers are labeled with standard symbols for the classes of fires they can put out. A red slash through any of the symbols tells you the extinguisher cannot be used on that class fire. A missing symbol tells you only that the extinguisher has not been tested for use on a given class of fire. Class A: Ordinary combustibles such as wood, cloth, paper, rubber, and many plastics. Class B: Flammable liquids such as gasoline, oil, grease, tar, oil-based paint, lacquer, and flammable gas. Class C: Energized electrical equipment including wiring, fuse boxes, circuit breakers, machinery, and appliances. Many household fire extinguishers are “multipurpose” A-B-C models, labeled for use on all three classes of fire. If you are ever faced with a Class A fire, and you don’t have an extinguisher with an “A” symbol, don’t hesitate to use one with the “B:C” symbols. Warning: It is dangerous to use water or an extinguisher labeled only for Class A fires on a grease or electrical fire. Extinguisher sizes: Portable extinguishers are also rated for the size of fire they can handle. This rating is a number from 1 to 40 for Class A fires and 1 to 640 for Class B fires. The rating will appear on the label. The larger the number, the larger the fire extinguisher can put out. Higher-rated models are often heavier. Make sure you can hold and operate the extinguishers are rated 1A or 2A and/or 5B, 10B, or 20B. The “C” just indicates that you can use it on electrical fires. Extinguishers should be installed in plain view above the reach of children near an escape route and away from stoves and heating appliances. Extinguishers require routine care. Read your operator’s manual and ask your dealer how your extinguisher should be inspected and serviced. Rechargeable models must be serviced after every use. 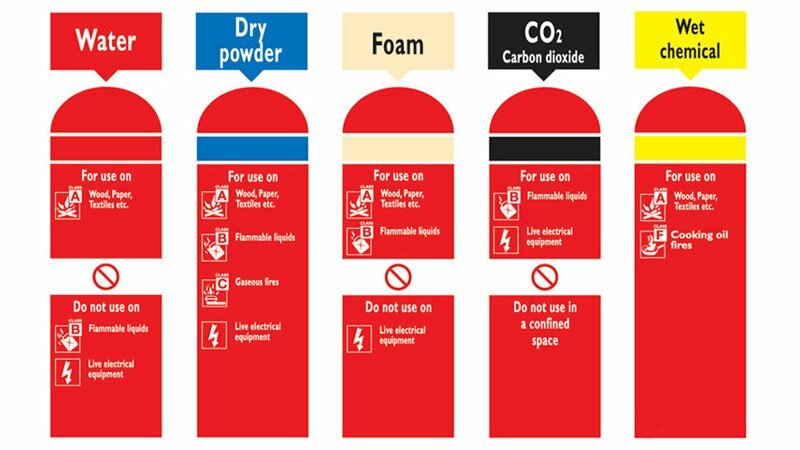 Disposable fire extinguishers can be used only once; they must be replaced after one use. Following manufacturer’s instructions, check the pressure in your extinguishers once a month. Stand 6 to 8 feet away from the fire and follow the four-step PASS procedure. If the fire does not begin to go out immediately, leave the area at once. Always be sure the fire department inspects the fire site. PULL the pin out: This unlocks the operating lever and allows you to discharge the extinguisher. Some extinguishers have other devices that prevent inadvertent operation. SQUEEZE the lever below the handle: This discharges the extinguishing agent. Releasing the lever will stop the discharge. Some extinguishers have a button that you press. Make sure the fire department has been notified by dialing 911. Make sure the fire is confined to a small area and that it is not spreading beyond the immediate area. Make sure you have an unobstructed escape route to which the fire will not spread. Make sure that you have read the instructions and that you know how to use the extinguisher. It is dangerous to fight a fire under any other circumstances. Instead, leave immediately and close off the doors and windows if possible.